In this Dec. 9, 2018, file photo, Kansas City Chiefs offensive tackle Jeff Allen during the first half of an NFL football game in Kansas City, Mo. Allen thanked the man who helped pull his vehicle out of the snow with tickets to next week's AFC Championship game. 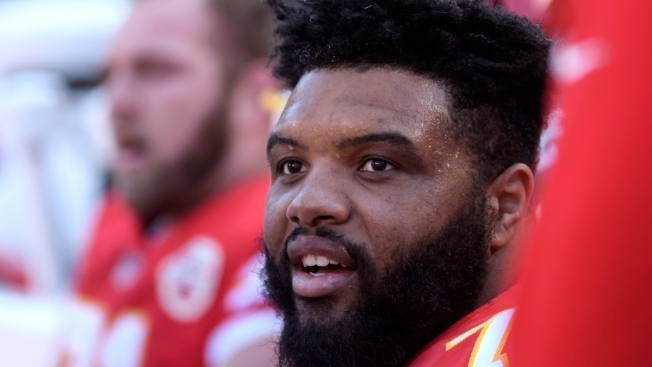 Allen said he got stuck on the way to Arrowhead Stadium on Saturday, Jan. 12, 2019, because of the snow, but he made it in time for the Chief's victory over the Indianapolis Colts because of the Good Samaritan. A random act of kindness has netted AFC Championship tickets for a homeless man called Dave who helped dig a Kansas City Chief out of the snow. Offensive linesman Jeff Allen posted on Twitter that his car got stuck as he was heading to Arrowhead Stadium to take on the Indianapolis Colts in Saturday's playoff. Allen wrote that "a nice guy named Dave," who didn't know he is a Chief's player, got him back on the road. NBC affiliate KSHB reports the good Samaritan is Dave Cochran, a homeless man who lives in his SUV with his girlfriend and their dog. Cochran told the station that they had just helped dig a car out of the snow before seeing Allen's stuck vehicle. “It said Texas plates," Cochran told KSHB. "He wasn’t used to this weather. He isn’t used to this coldness. He is from Texas." Allen isn't a Texas native, but he played for the Houston Texans from 2016 to July 2018 when he was released just two years in to a four-year contract, according to the NFL. Allen made it to the game and the Chiefs knocked off the Indianapolis Colts 31-13 to move on to the AFC Championship game against the New England Patriots next Sunday. Cochran told KSHB that while he's excited for the chance to go to championship game, he wasn't expecting anything in return other than a thank you.